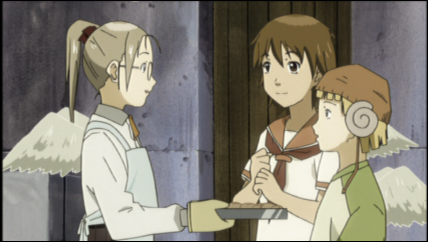 The only bakery where a haibane is allowed to work is the oldest bakery in town. Kana works in the clock tower if I remember correctly, and that’s probably fairly old. 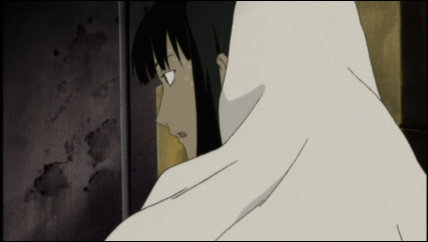 The limitations on where a haibane may work must be imposed by the Haibane-Renmei, but it leaves the question of whether the shop owner has say in it. 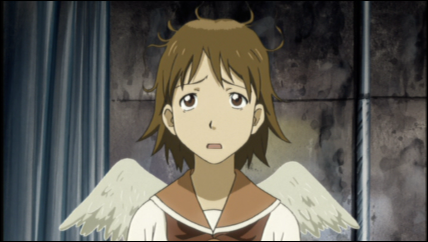 Did the baker have a choice in whether a haibane could work at his shop? Or did he submit that this shop would be willing to hire a haibane? Reki makes a lot of judgment leaps, from the house mother’s serving carrots being a ploy to get pancakes, to it being all about getting Reki to eat carrots. The the house mother makes a comment about how Reki didn’t run away. 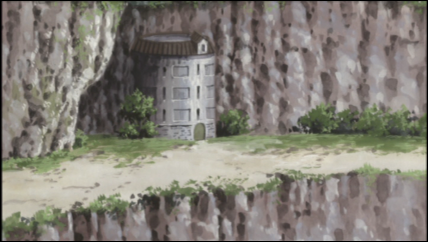 If I look at this casually, it suggests Reki’s been in Old Home since she was a child, a Young Feather, and she herself used to run off without eating her carrots. Her name being based on her dream suggests she was at least Kuu’s age when she hatched, however (whereas the Young Feathers go by future dreams of what they want to do). Looking for something greater in the house mother’s line may suggest Reki used to be the type to run away from her problems. If she would literally “run away”, this could tie in with her being one who “likes to walk a lot”, as Hikari or one of the others mentioned previously about Reki. Then there’s Reki’s recurring dream. Is it the same dream as when she was in a cocoon? If so, is the dream she told a lie, to cover up a nightmare she had in the cocoon? When Rakka was a bit hesitant about reciting her own dream, Reki questioned if it had been a bad dream. If Reki’s own dream was a bad one, she’d be understanding if someone else had the same. I like the English voices for characters more and more each time I hear them. Hikari’s voice fits her perfectly. Ladylike, but forgetful; showing grace before fumbling; leading the way, but not always having it all together. A good performance by Hunter Mackenzie Austin. J-Ray Hochfield continues to provide an excited youth, filled with both wonder and experience, as the playful and guiding Kuu. Carrie Savage as Rakka reminds me of why I like Kirsten Dunst as Kiki in Kiki’s Delivery Service. The voice is fun, but can be uncertain. A very sweet voice for the character, both for Dunst’s Kiki and Savage’s Rakka. Whether I enjoy the English voices so much because I introduced myself to them first, I’ll never know. Whether I enjoy them so much because I didn’t have something to compare them with, I’ll never know. I do believe I’d enjoy them had I watched the entire series in Japanese before seeing an episode in English, though. It’s like Princess Tutu, Azumanga Daioh, and so many other dubs where you know thought and consideration went into getting the best matches for the characters. 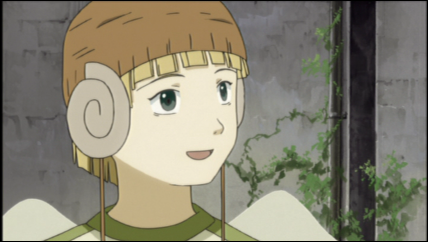 With Haibane-Renmei, I really do feel as if I could continue to watch the series only in English, and not be missing out on anything. If anything, it’s more comfortable. No ready, no processing words spoken for meaning. No stopping to think, “I know this word, so what is it?” No thinking, “That’s a strange way to translate that line into English.” No fear that if I look away from the laptop for two seconds, I’ll miss (reading) what someone says. It’s rather liberating. It helps when the series isn’t based in Japan, with honorifics and other subtleties which don’t translate into English. 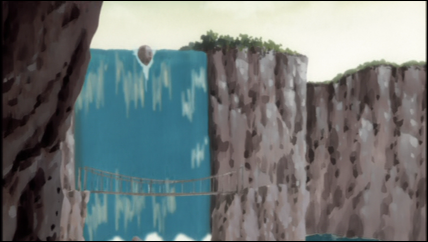 Back to the episode, there’s quite the path to reach the council temple. I was surprised to hear the councilman inside refer to the organization as the “Charcoal Feather Council”. That’s something I’d wondered since episode one. “Why call them haibane in the dub? Why not call them charcoal feathers? Can adding one syllable really make things that much more difficult?” Likewise, “Why call it the Haibane Renmei? Why not call it the Charcoal Feather Council?” At least the explanation of what haibane means, as well as the Haibane Renmei, keeps it from feeling inconsistent from one use to the other. At the same time, I haven’t seen the episode in Japanese yet, so I’m assuming the councilman spoke “Haibane Renmei” to refer the council in that one line within the temple. As I see it, Kuu has the important lines this episode. She talks about how one can fly if one really believes in it. She and Rakka both had dreams where they were falling through the air, so they have a special bond when it comes to flying. Whereas I expect Reki to have growth related to her painting and her dreams—I imagine the paintings she wouldn’t show Rakka are paintings of her dreams, the state of the room she wouldn’t allow Rakka to enter being a mess visibly showing the angst Reki meets with when painting—I foresee Rakka reaching for flight, reaching to travel higher than the top of the clock tower, up above the town’s outer walls, and beyond. It’s not just a dream of flight, but about the crows as well. Kuu feels bad for them. She can understand them. While she doesn’t specifically state it as such, she compares the crows with the haibane. 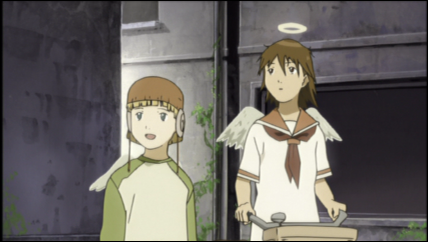 The crows pick at trash for food, and the haibane only wear used clothes and items. They both take things which are no longer wanted by the humans. A crow appeared in Rakka’s dream. Although she doesn’t remember it, this might be enough for her to come to understand the crows as well. A strong point I see in this series is that none of the main characters have designs trying to make them overly pretty or cute (Hana notwithstanding). They’re average people. I even thought Kana was a boy at first, and questioned why the character was given such a feminine voice in the dub. It didn’t take more than a minute to realize she’s a girl. Other series would have given her big, sparkly eyes, the type reserved for girls and pretty boys. Even Rakka with her hair always standing about doesn’t say, “Look at how pretty I am!” She’s attractive yes, but not in an exaggerated way. Characters’ personalities will be what draws the viewer to them. That, and optionally wearing a sweater with a single pocket in the front. That Reki used to be the type to run away from her problems is an incredibly astute deduction, I am humbled. Now I wish a bit that I stopped to think between episodes back when I watched this. Dreams that Reki is having now is a manifistation of her mind struggling to piece together the dream in the cocoon, which she can not remember. 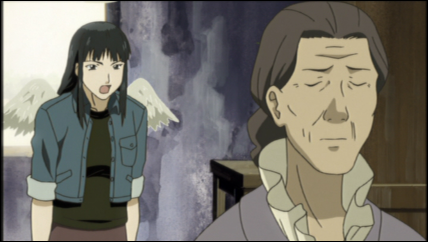 I don’t remember how explicitly it was stated by knowledgeable characters while making expository remarks, but it’s imperative for haibane to recall their cocoon dreams. There’s a good but spoiling explanation why, so just trust me that it is for now. Therefore, Reki struggles to accomplish that. Reki’s dream paintings, as you guessed well, are her tools to record pieces that she can remember… I expect that you of all people should be able to guess what actually is in her “secret” room.